The heart of the furniture industry may be centered in North Carolina but many New Jersey-based companies were all part of the action — and excitement — at this spring’s High Point Market. 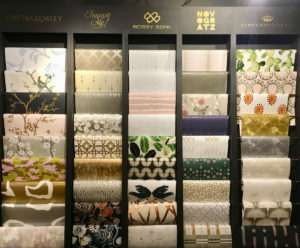 Thibaut, Nourison, Tempaper and Kas Rugs were among the countless showrooms we visited that had ties to the Garden State. Representatives from each share their newest looks and market takeaways. 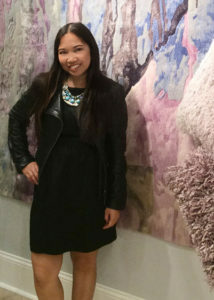 Cortney Henry, public relations manager at Thibaut. Meg Fox: What were some of the company’s market highlights? 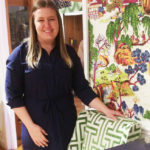 Cortney Henry: Our market visitors loved the burst of color in our showroom where we were showcasing our new Dynasty collection of coordinating wallpaper and fabrics. The colors and patterns played in perfect harmony. Even on the gloomiest of days when a rain and windstorm came through High Point, it was still sunny at Thibaut. We were also excited about the launch of our new Dorset Bench, which is perfectly proportioned to fit at the end of a bed or in a hallway, and some new creations from our Grasscloth Wrapped Furniture program, like new frame ideas for mirrors and a cabinet with contrast zigzag patterned doors. Left: Dorset Bench; Right: Grasscloth personalizes a mirror and cabinet doors. The chair is upholstered in Ming Trail Green. 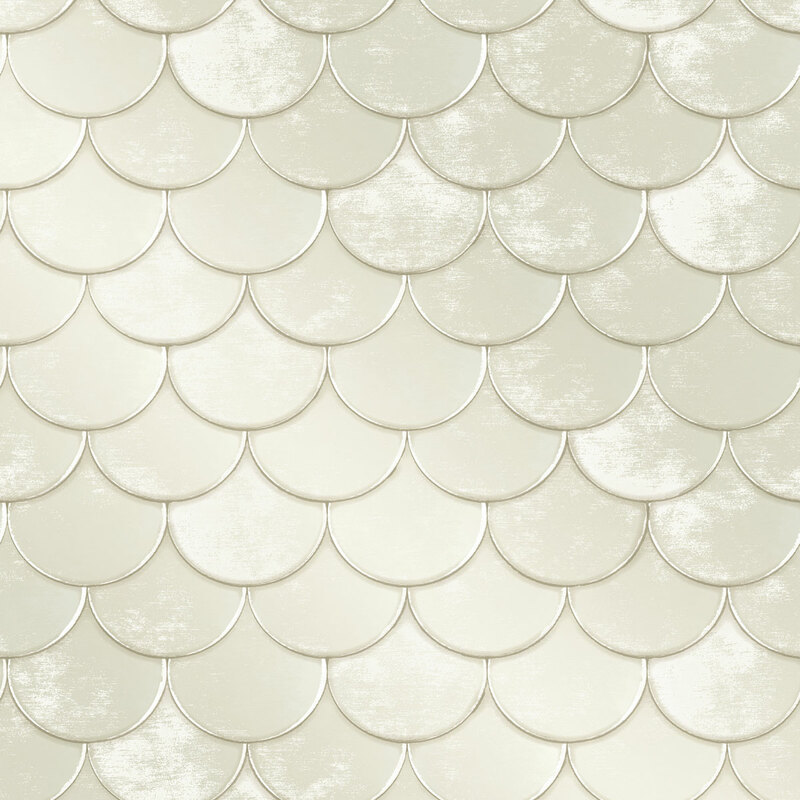 Wallpaper is Asian Scenic, a fresh interpretation of Chinoiserie with a modern twist. MF: What are some of the trends you’re seeing in today’s home fashions? 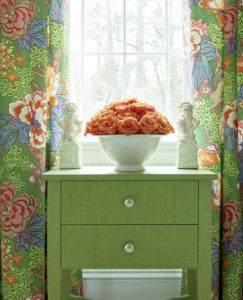 CH: I personally love the resurgence of big beautiful florals. While geometrics shapes — especially on wallpaper — are as popular as ever, flowers and botanical prints are always in fashion, and we’ve got a knack for making them feel new. Things are moving in a bold color direction and our newest collections feature reds, eggplant, strong blues and vibrant greens. It’s not that a neutral like beige grasscloth is boring, but what an incentive to push the boundaries of pattern and color! 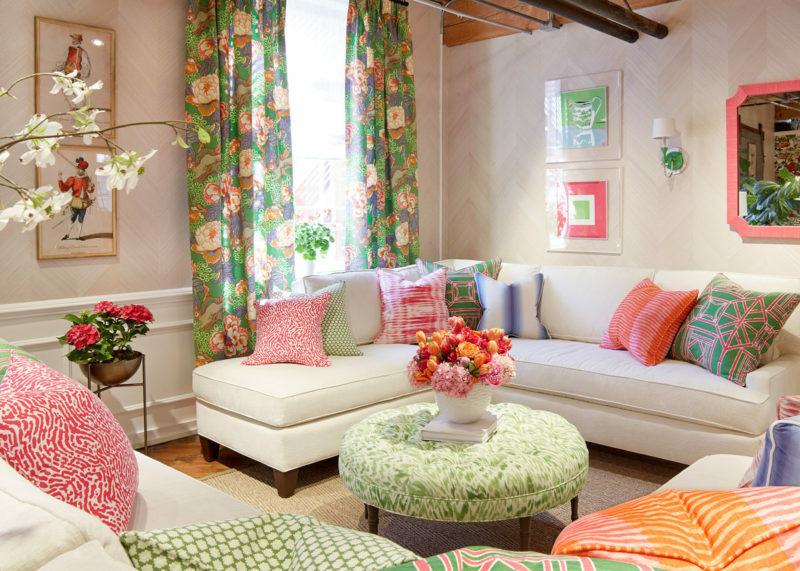 Framing the windows is Honshu — an exotic large-scale floral pattern in vibrant multi-colored hues. MF: What generated the most buzz? 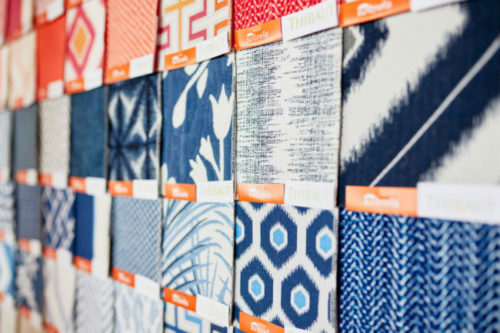 CH: Our exclusive Crypton Home® and Sunbrella® fabrics. Everyone loved our demo station where we spilled red wine on our fabric. And of course all of our amazing flower arrangements! I often hear, “Those can’t be real!” as people walk through the showroom – but they are, and they truly make our space special. Even my friend Carson Kressley Instagrammed them! Soft, durable and available in a wide array of textures and colors — Crypton® fabrics are stain and odor resistant. Trendsetting patterns and colors from Sunbrella® — another leader in performance fabrics — suitable for indoor and outdoor use. Television personality, actor and designer Carson Kressley shares his love of Thibaut — from the fabrics to the fresh flowers — in an Instagram post during his High Point visit. 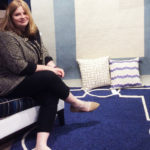 Kimberly Weling, social media & public relations specialist at Nourison standing with a 3D-like area rug from the company’s new Prismatic collection. 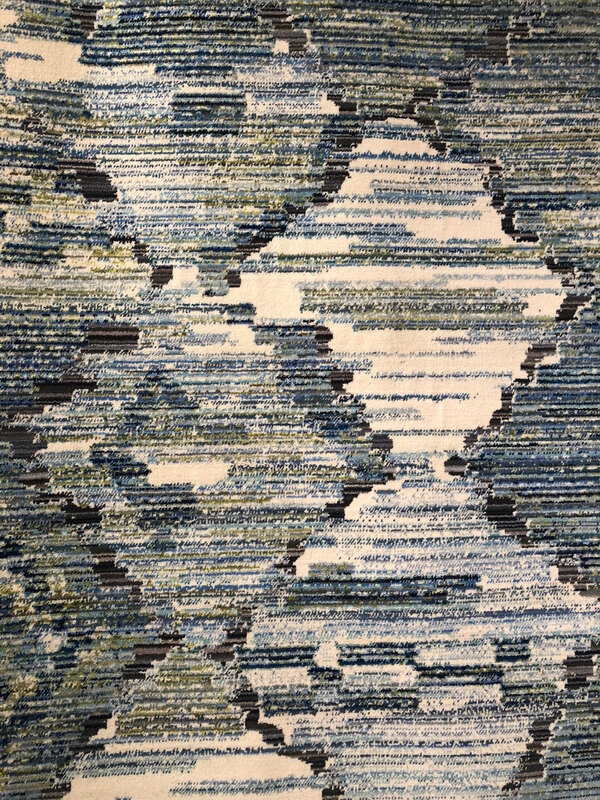 Kimberly Weling: Highlights include our newest additions to the Prismatic Collection in abstract designs, which stand out in both color and texture. Everyone was also excited about the new Barclay Butera rugs featuring bold stripes and modern, abstract patterns. The designs are very “Barclay” with a coastal chic look designed to coordinate with his collections for Lexington Home Brands and Castelle. KW: Furniture pieces and home accents in blue hues – everything from sofas and chairs to pillows and throw blankets. I’ve also noticed softer tones in blush, celadon and aqua as well as abstract and painterly designs. 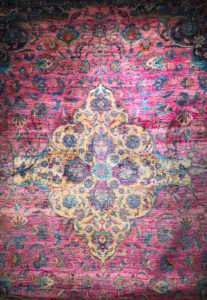 KW: People were talking about our gorgeous Sari Silk rugs. They love how colorful and detailed they are and how they are such a statement piece. 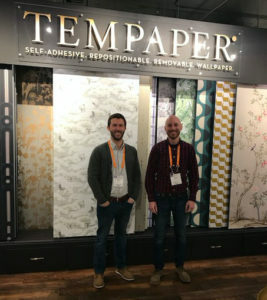 Tempaper’s Paul Luthman (left) and Ryan Weber at the company’s High Point showroom. Danielle Tighe – marketing manager: The launch of our new Chinoiserie design Canopy that pairs the traditional Chinoiserie artisan art form with a modern jungle theme. 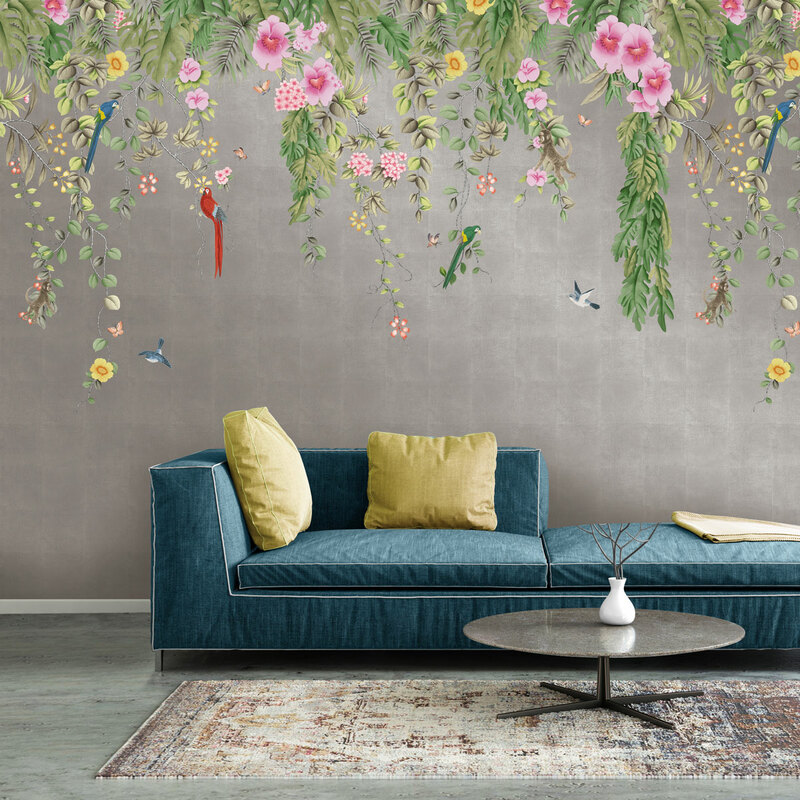 Unlike traditional Chinoiserie, Canopy depicts a hanging vine scene and flows top-down. 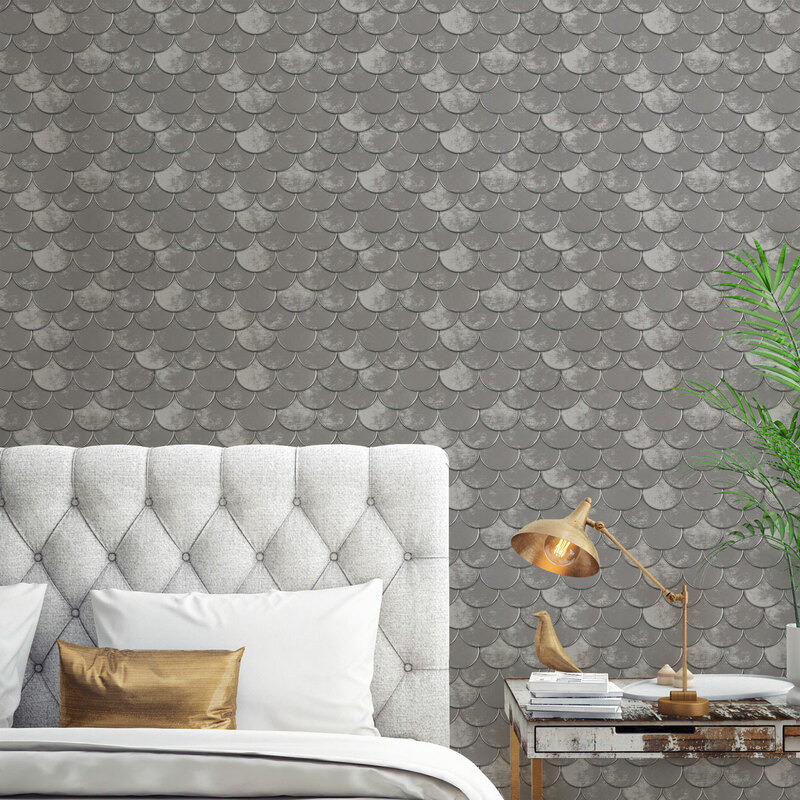 Other newsworthy highlights was the launch of Novogratz x Tempaper, which is a beautiful collection of 11 fresh and quirky patterns available to the masses. In addition, Genevieve Gorder x Tempaper Collection II launched at market with two new color ways of fan-favorite Brass Belly. Tempaper could also be spotted all over the market in the showrooms of different dealers including Worlds Away, Zuo Modern and many more. DT: Pairing or layering different styles within one room or space, such as traditional and modern. I also think rich textures are still very relevant. The buzz about our metallic champagne Distressed Gold Leaf design is too strong to ignore! DT: People were talking about our new Brass Belly in Pearl in the Genevieve Gorder x Tempaper collection. Clients constantly touched the paper throughout the week to see if it was actually three-dimensional. The texture looks that real! 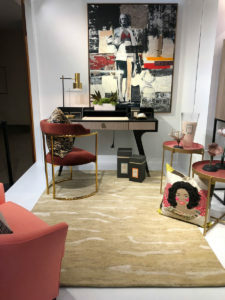 DT: We also received a ton of positive feedback about the booth in general and our much buzzed about “designer wall” which housed the Tempaper collections for Bobby Berk, Inspire Me Home Décor, Cynthia Rowley, Genevieve Gorder and the newly added Novogratz. 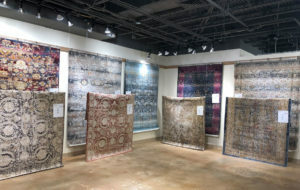 Wendy Reiss, vice president of sales and national accounts at Kas Rugs. On display are designs from Libby Langdon’s Indoor/Outdoor Hampton’s Collection. Wendy Reiss: High Point was a good show for us! Our Design Seminar and lunch entitled “Interior Design for Real Life w/ Libby Langdon” was well attended with standing room only. Libby introduced her new indoor/outdoor pillow line that coordinates with her Hamptons Outdoor rug line as well as a new collection of indoor pillows that coordinates with her hand-tufted Soho rug collection. 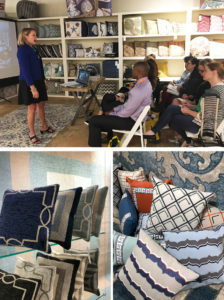 Top: Designer Libby Langdon speaks at the company sponsored Design Seminar; Left: New indoor/outdoor pillows from Libby Langdon; Right: Indoor pillows that coordinate with Langdon’s Soho rug collection. 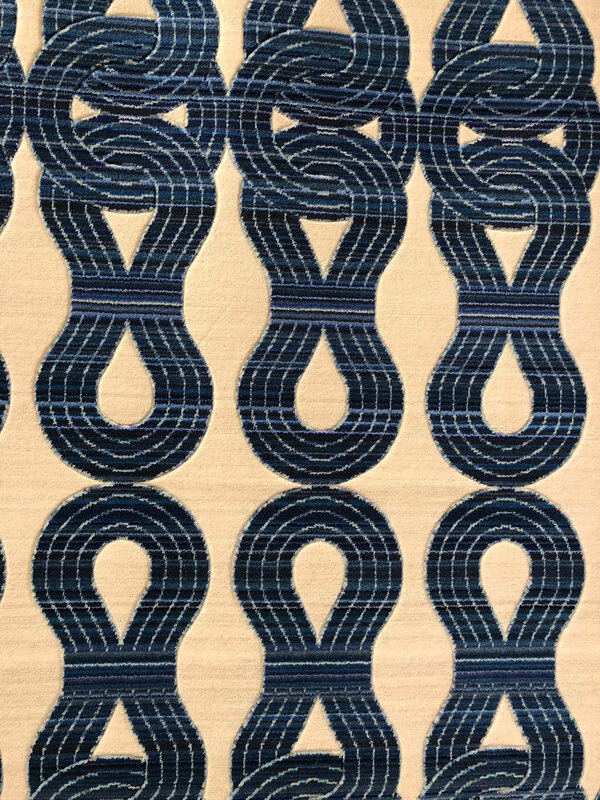 WR: Our new Montreal collection of machine woven shrink polyester and viscose was extremely well received as well as our new Brooklyn collection featuring blues, oranges and golds. And, Papillon and Grant — our new products at opening price points — also attracted a lot of attention. Shown is the Papillon collection (back row) and Grant in front. WR: While blues and grays continue to trend as well as distressed looks and abstracts in rugs, art and more, I enjoyed seeing so much color at this show. There was also a lot of focus on indoor/outdoor products of all kinds. I also enjoyed seeing the use of natural elements such as stone, gemstones and distressed woods. 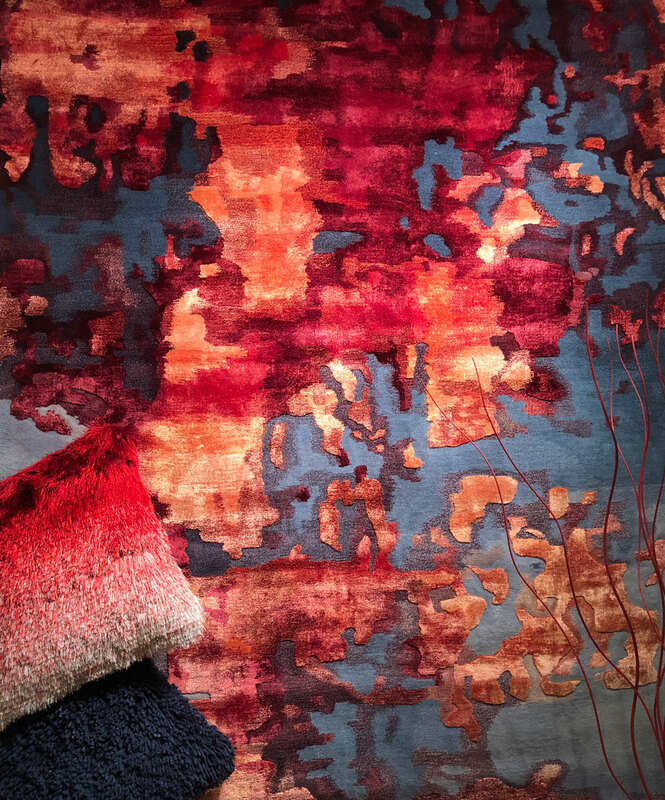 The Serenity rug from Kas — shown here — was highighted in a Trend Watch presentation at market. WR: How wonderful indoor/outdoor products and easy care fabrics and living overall have become. There are so many wonderful options in furniture and accessories to create the perfect outdoor space.